For the past few weeks, there is a 30 min interval in late afternoon on sunny days when I can’t look out my north-facing windows for fear of being blinded by the entire upper portion of the all-glass building reflecting the full brunt of the sun. I’d like to know where else the effect is visible in the neighborhood…it seems the owner should tone down the reflectivity. There are lots of places in NYC where you get this blinding reflection. 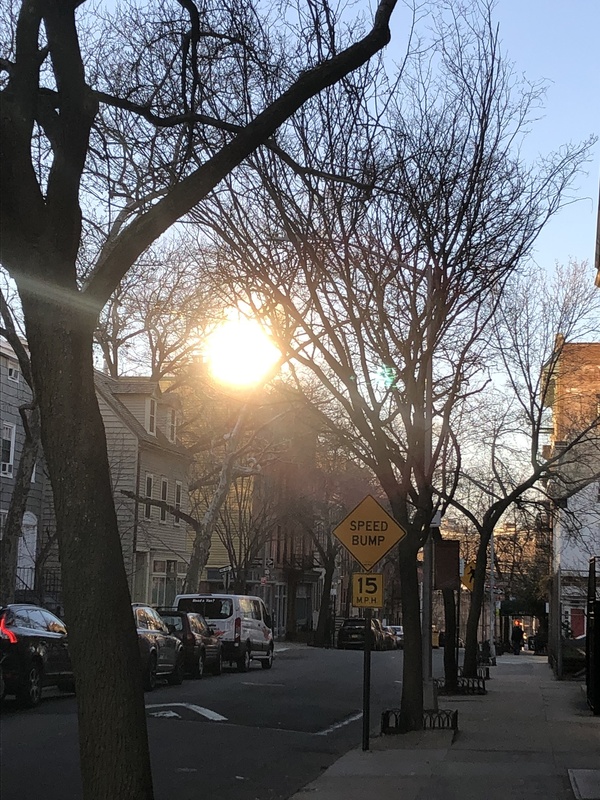 I’ve seen this on Montague Street, where you get sunlight bouncing off buildings deeper into downtown Brooklyn. I don’t think there’s anything to be done about this. On the other hand, you could think of this as bonus sunlight for somewhere usually in shadow. Sad news, Sounds like the contractor wasn’t providing proper safety for their workers. Everyone should post a comment. Many nyt commenters thus far are of the “do whatever it takes” mindset regardless of the impact on Brooklyn communities. 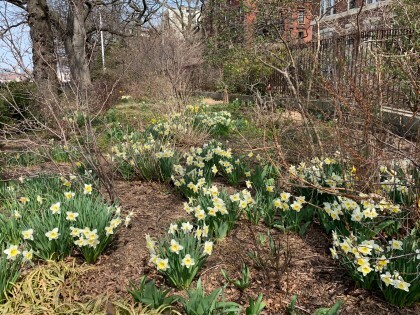 Yes, there’s a lot of knee-jerk animosity towards Brooklyn Heights out there. It’s clearly not just about us though. “SilverShoes” (below) is right – and I’ll see if I can post something … briefly there! 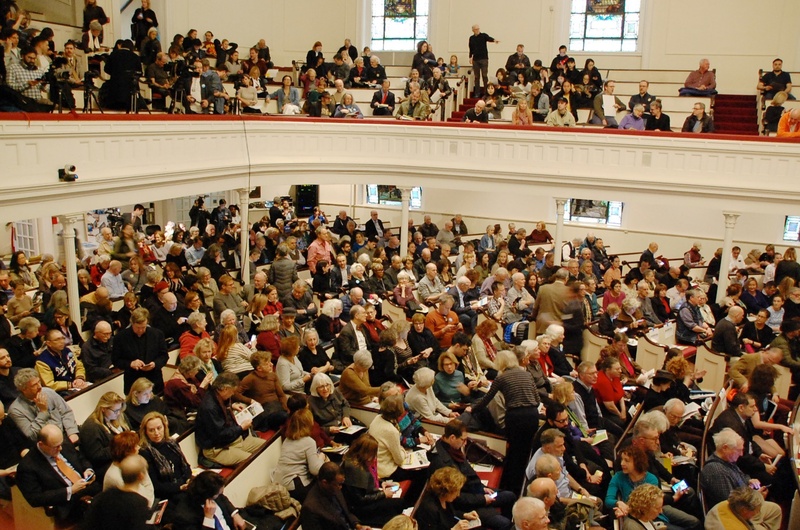 Gosh, you can see me in the photo from Plymouth Church! I’m in the balcony at extreme left, first row in the light shirt. I just made several comments there (posting as “Andrew Porter”). I see that local BH resident Ed Townes, former editor/publisher of The Brooklyn Paper, just posted a comment. (below): only if you’ve set the comments to show the newest on top. I set Disqus to show the oldest on top, so you can read older posts before their answers. How so? the exhaust gases have to go somewhere, vents will simply release them back into the surrounding atmosphere. Andrew, I approached you a couple years ago at Delarocco’s (I think) and asked, with the intention of introducing myself, if your name was Andrew, and you said no! Should I try again next time? Twasn’t me! I’ve never eaten there. The only place I ever eat out at in the Heights is Teresa’s, and there only a couple of times a year. What, if any, are my high-speed Internet options? Presently I’m with Spectrum and it’s not great. Also, I don’t think my building has been wired for Fios. Ah I see. Sorry to hear about that, and glad you survived. So I guess there’s a guy in the neighborhood who maybe kinda resembles the photos of you I’ve seen online.